More than seventeen million Americans are afflicted with diabetes and these people have four times the rate of coronary heart disease (CHD) as non-diabetics. Furthermore, diabetic women have a 3.8 fold greater risk for CHD compared to diabetic men. Little is known why diabetic women are at an increased risk for CHD. It is possible that diabetic women with cardiovascular disease (CVD) have a greater inflammatory response resulting in an increased platelet neutrophil conjugate formation than diabetic men with CVD or non-diabetic women with CVD. This study tested the hypothesis that platelet-neutrophil conjugates, which are associated with several cardiovascular diseases, are increased in diabetic women with CVD compared to diabetic men with CVD and non-diabetic women with CVD. 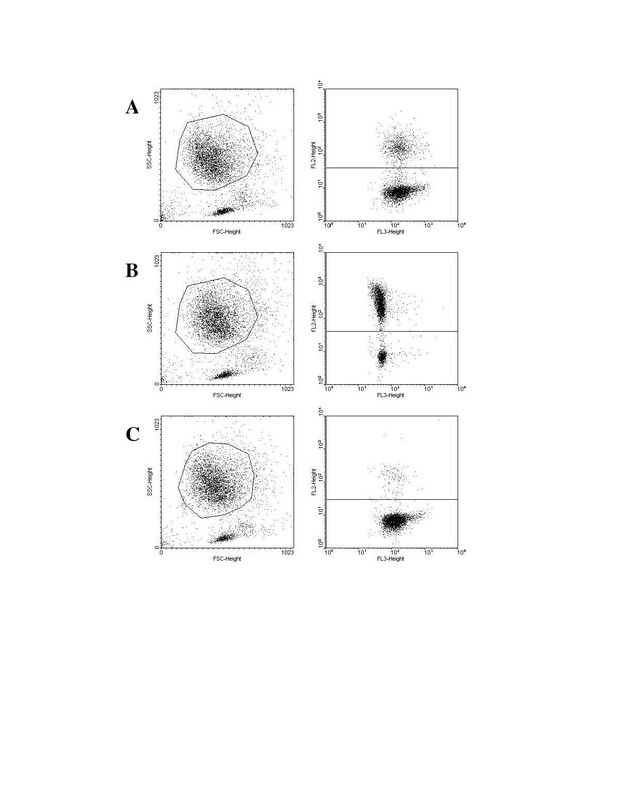 Platelet-neutrophil conjugates were quantified by flow cytometry. The primary method is through direct binding of the neutrophil PSGL-1 receptor with P-selectin expressed on the platelet. In this study, we found when the blood was stimulated with PAF (platelet activating factor), diabetic women without CVD demonstrated an increase in platelet-neutrophil conjugates compared to diabetic women with CVD and non-diabetic women with CVD (% conjugates: 63.3 ± 5.2 vs 46.8 ± 4.3 vs 48.6 ± 3.4, p < 0.05). The stimulation ratio was significantly increased in diabetic and non-diabetic women with CVD in comparison to diabetic men with CVD (ratio: 3.3 ± 0.4 vs 3.3 ± 0.3 vs 2.1 ± 0.3, p < 0.05). These results suggest that platelets and neutrophils in diabetic women have a greater potential for activation compared to diabetic men and may contribute to thrombosis/inflammation and the greater severity of coronary heart disease observed in diabetic women as compared to diabetic men. Diabetes poses a significant risk factor for cardiovascular disease in both men and women, but the incidence of type 2 diabetes is markedly greater in women . It is known that diabetic women have a significantly greater risk and severity of cardiovascular disease than diabetic men. Diabetic women have an elevated base line risk, and have more cardiovascular risk factors than men . From the Framingham Heart Study, diabetic women have an age-adjusted risk ratio of 3.8 for coronary heart disease (CHD) compared to diabetic men. Despite the importance of complicating factors in the severity of heart disease in diabetes, little is known about the interrelationships of risk factors and cardiovascular disorders, particularly in diabetic women. Of particular interest is the inflammatory response and its effect on cardiovascular disease. The inflammatory response complicates cardiovascular disease in several ways . It was observed that diabetic men with cardiovascular disease exhibit chronic inflammation . Since inflammation amplifies atherosclerosis and ischemia-reperfusion injury, it is important to investigate if this complication is exacerbated in diabetic women. An enhanced inflammatory response may contribute to the greater rate, recurrence and severity of myocardial infarction and ischemic heart failure in diabetes. From recent laboratory ischemia-reperfusion studies, it appears that reperfusion injury following ischemia is exacerbated in type 1 diabetes . Neutrophils accumulate in the coronary microcirculation following ischemia, amplifying reperfusion injury in diabetic hearts [6, 7]. Platelets are known to mediate the activation of leukocytes. Our laboratory demonstrated that when the platelet and neutrophil interaction is inhibited, ROS production is decreased. These experiments were performed in men, but very little is known about the cell-mediated inflammatory response in diabetic women, or how it compares to the inflammatory response of men. The aim of this study was to investigate the severity of platelet-neutrophil conjugates in diabetic men and diabetic women with ischemic heart disease. We evaluated the formation of platelet and neutrophil conjugates in non-diabetic women without cardiovascular disease, non-diabetic women with cardiovascular disease, diabetic women without cardiovascular disease, diabetic women with cardiovascular disease, non-diabetic men with cardiovascular disease, and diabetic men with cardiovascular disease. We found the stimulation ratio was significantly greater in diabetic and non-diabetic women with CVD in comparison to diabetic men with CVD, suggesting diabetic women's blood is hyper-reactive to stimulation compared to diabetic men's blood. These results indicate that platelets and neutrophils in diabetic women have a greater potential for activation compared to diabetic men. Platelet-neutrophil conjugates may contribute to thrombosis/inflammation and the greater severity of coronary heart disease observed in diabetic women as compared to diabetic men. Four groups of women were studied; non-diabetic women without cardiovascular disease (NDW-CVD) (n = 23), non-diabetic women with cardiovascular disease (NDW+CVD) (n = 25), diabetic women without cardiovascular disease (DW-CVD) (n = 20), and diabetic women with cardiovascular disease (DW+CVD) (n = 24). Two groups of men were studied; non-diabetic men with cardiovascular disease (NDM+CVD) (n = 8) and diabetic men with cardiovascular disease (DM+CVD) (n = 18). These patients were enrolled from the patients attending the Cardiology Clinic at the Veterans Administration Hospital (Tucson, AZ) and the Diabetes Clinic at the University of Arizona Medical Center (Tucson, AZ). The protocol was approved by the University of Arizona Institutional Review Board. Patient's characteristics are summarized in Table 1 and their medications are summarized in Table 2. Fifteen milliliters of blood were drawn in a citrate tube from all the patients. The severity of diabetes was determined by the patient's hemoglobin A1C. A subject was considered to have cardiovascular disease if they had a previous cardiovascular event (myocardial infarction, coronary artery bypass graft (CABG), stroke, percutaneous coronary intervention (PCI), or some combination). Demographics of the women and men. *P < 0.05 compared to NDW-CVD group **P < 0.05 compared to DW-CVD group ***P < 0.05 compared to NDW+CVD group ψ The proportions are significantly related (P < 0.05) Non-diabetic women without cardiovascular disease (NDW-CVD), Non-diabetic women with cardiovascular disease (NDW+CVD), Diabetic women without cardiovascular disease (DW-CVD), and diabetic women with cardiovascular disease (DW+CVD), Non-diabetic men with cardiovascular disease (NDM+CVD), and Diabetic men with cardiovascular disease (DM+CVD). Distribution of medications in women and men. ψ The proportions are significantly related (P < 0.05) Non-diabetic women without cardiovascular disease (NDW-CVD), Non-diabetic women with cardiovascular disease (NDW+CVD), Diabetic women without cardiovascular disease (DW-CVD), and diabetic women with cardiovascular disease (DW+CVD), Non-diabetic men with cardiovascular disease (NDM+CVD), and Diabetic men with cardiovascular disease (DM+CVD). The platelet-neutrophil conjugates were determined by measuring fluorescent markers specific to platelets and leukocytes. The leukocytes were labeled by mixing whole blood with an equal volume of solution containing LDS-751 (Molecular Probes). Platelets were measured as the fluorescence of a PE-conjugated antibody (Pharmingen) against CD42b (GPIb). Through the use of these two different colored probes, it was possible to gate the events using the flow cytometer. These events were then designated the platelet-neutrophil conjugates. Representative FACS plots to assess platelet-neutrophil conjugates in a diabetic woman with cardiovascular disease. (A) Unstimulated blood (22.4% of platelet-neutrophil conjugates). 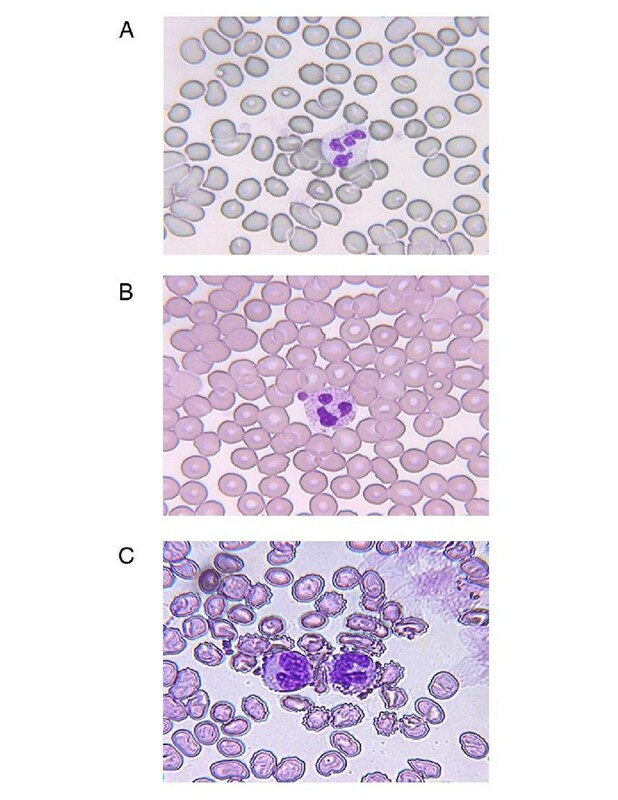 (B) Stimulated blood (75.9% of platelet-neutrophil conjugates). (C) Inhibited blood (3.5% of platelet-neutrophil conjugates). We examined the estrogen levels in the women to determine if there was a difference among the groups, possibly influencing the platelet-neutrophil conjugate formation. The blood samples were centrifuged (Megafuge 1.0 R, Baxter Scientific Products) at 2,500 RPM for thirty minutes at 4°C. The plasma was pipetted from each sample and then immediately stored at -70°C. Once a sufficient number of samples were collected, they were removed from the freezer and thawed to room temperature. The estradiol was measured using a double antibody 125I radioimmunoassay from DPC. All samples were run in duplicate. The samples were prepared according to the directions provided by the company. Standard tubes were made and 100 μL of Estradiol Antiserum was added to all tubes except the nonspecific binding and the total count tubes. The samples were incubated for 2 hours at room temperature and then 100 μL of 125I Estradiol was added to all tubes. The samples were then incubated for one hour at room temperature. Cold precipitating solution was added to all tubes and the samples were incubated for 10 minutes at room temperature. Finally, the samples were centrifuged for 15 minutes at 3000 × g and the supernatant was decanted. The precipitate was retained for counting. Each tube was counted for one minute. The values of estradiol were obtained in pg/mL from a logit-log representation of the calibration curve. Data were collected in notebooks and transferred to a Computer Spreadsheet Format (Excel for Windows). The summary results are represented as mean ± standard error of the mean (SEM). Comparisons among the four groups were made with an ANOVA (Sigma-Stat 3.0). A Dunn's and Holm-Sidak Post hoc test was performed (Sigma-Stat 3.0). A Chi squared test was performed to determine if the percentages in table 1 and 2 were significantly related. P < 0.05 was considered as statistically significant. Table 1 summarizes the characteristics of the six groups studied. There was a significant difference of age in the NDW+CVD and DW+CVD groups compared to the NDW-CVD and DW-CVD groups (p < 0.05). There was also a significant difference in body mass index (BMI) of the NDW+CVD group compared to DW-CVD group (p < 0.05) and DW-CVD group compared to NDW-CVD group (p < 0.05). There was no significant difference in the duration of diabetes among the three diabetic groups. The glycated hemoglobin (HbA1C) was significantly greater in DW-CVD and DW+CVD compared to NDW-CVD (p < 0.05). The glycated hemoglobin (HbA1C) was also significantly greater in DW-CVD compared to NDW+CVD and DW+CVD compared to NDW+CVD (p < 0.05). There was a significant difference in hypertension and hypercholesteremia among the groups. There were no significant differences in smoking among any of the groups. The various drug therapies that the patients were receiving are summarized in Table 2. There was no significant difference in the percentages of women taking HRT or statins among any of the groups. There was a significant difference in the percentages of women taking beta blockers, diuretics, nitrates, ACE inhibitors, antioxidants, aspirin, and hypoglycemic agents. Figure 2 exhibits three pictures demonstrating platelet-neutrophil interaction in unstimulated blood from a non-diabetic woman without cardiovascular disease, stimulated blood (with PAF) from a diabetic man with cardiovascular disease, and stimulated blood (with PAF) from a diabetic woman with cardiovascular disease. Figure 3A reports the percentage of platelet-neutrophil conjugates measured in diabetic and non-diabetic women with and without cardiovascular disease. There is a trend toward increased platelet-neutrophil conjugates in diabetic women with cardiovascular disease in comparison to the other groups of women, but no statistical significance. Figure 3B reports the percentage of platelet-neutrophil conjugates measured in diabetic and non-diabetic men and women with cardiovascular disease. There was no significance among the groups of women and men. Pictures demonstrating platelet-neutrophil interaction. (A) Unstimulated blood from a non-diabetic woman without cardiovascular disease. (B) Stimulated blood (with PAF) from a diabetic man with cardiovascular disease. (C) Stimulated blood (with PAF) from a diabetic woman with cardiovascular disease. (A) Summary of percent of platelet-neutrophil conjugates for women in the study. Comparison of non-diabetic women without cardiovascular disease (NDW-CVD) versus non-diabetic women with cardiovascular disease (NDW+CVD) versus diabetic women without cardiovascular disease (DW-CVD) versus diabetic women with cardiovascular disease (DW+CVD). There is no significant difference among any of these groups. (B) Summary of percent of platelet-neutrophil conjugates for women and men in the study. Comparison of non-diabetic men with cardiovascular disease (NDM+CVD) versus non-diabetic women with cardiovascular disease (NDW+CVD) versus diabetic men with cardiovascular disease (DM+CVD) versus diabetic women with cardiovascular disease (DW+CVD). There is no significant difference among any of the groups. The percentage of platelet-neutrophil conjugates was increased in all groups after stimulation with PAF. 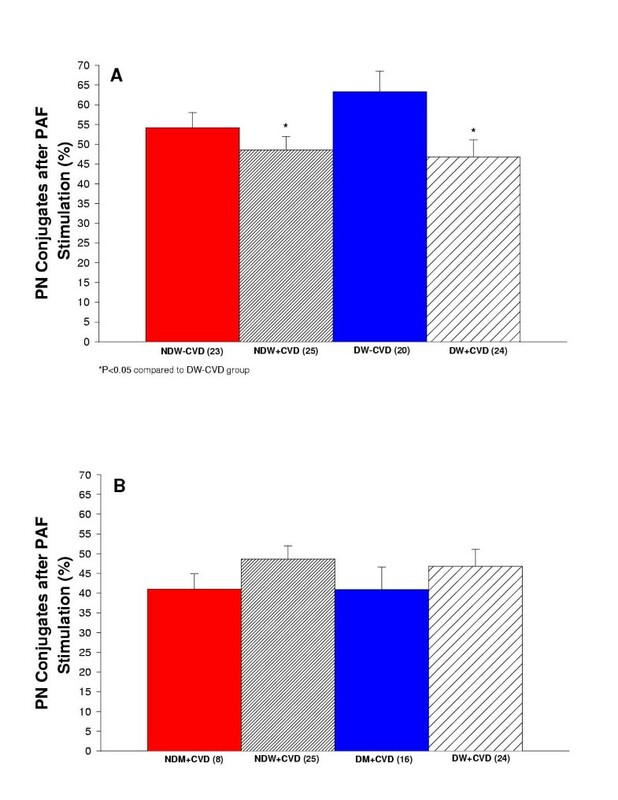 Figure 4A reports the percentage of platelet-neutrophil conjugates after stimulation measured in diabetic and non-diabetic women with and without cardiovascular disease. The greatest response to PAF stimulation was observed in the diabetic women without CVD. NDW+CVD and DW+CVD had significantly less platelet-neutrophil conjugates after stimulation in comparison to DW-CVD (p < 0.05). 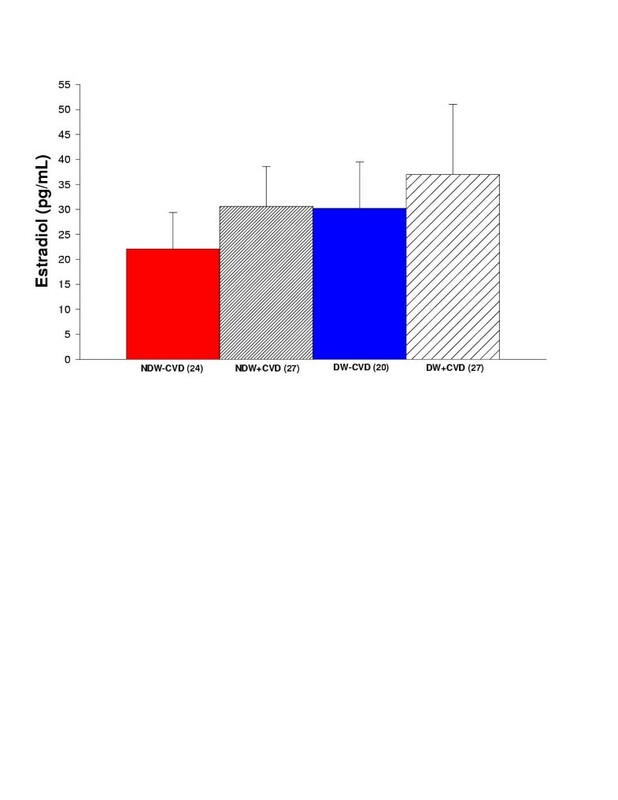 Figure 4B reports the percentage of platelet-neutrophil conjugates after stimulation measured in diabetic and non-diabetic men and women with cardiovascular disease. (A) Summary of percent of platelet-neutrophil conjugates after stimulation with PAF for women in the study. Comparison of non-diabetic women without cardiovascular disease (NDW-CVD) versus non-diabetic women with cardiovascular disease (NDW+CVD) versus diabetic women without cardiovascular disease (DW-CVD) versus diabetic women with cardiovascular disease (DW+CVD). NDW+CVD and DW+CVD had significantly less platelet-neutrophil conjugates after stimulation in comparison to DW-CVD (P < 0.05). (B) Summary of percent of platelet-neutrophil conjugates after stimulation with PAF for women and men in the study. Comparison of non-diabetic men with cardiovascular disease (NDM+CVD) versus non-diabetic women with cardiovascular disease (NDW+CVD) versus diabetic men with cardiovascular disease (DM+CVD) versus diabetic women with cardiovascular disease (DW+CVD). There is no significant difference among any of the groups. As an indicator of the reactivity to acute stimulation, we calculated the ratio of PAF stimulated to unstimulated conjugates. Figure 5A reports the platelet-neutrophil conjugate reactivity to PAF measured in diabetic and non-diabetic women with and without cardiovascular disease. NDW+CVD and DW+CVD had significantly less platelet-neutrophil conjugate reactivity to PAF in comparison to DW-CVD (P < 0.05). 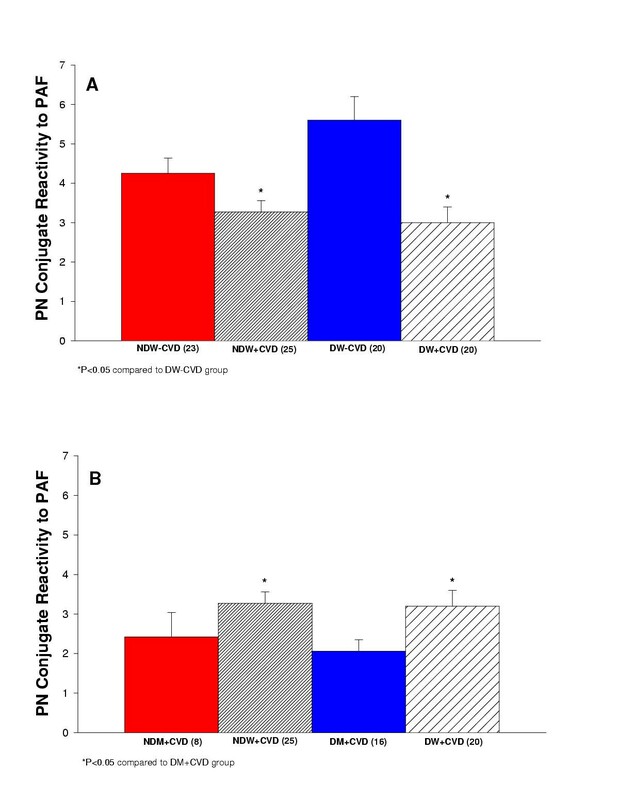 Figure 5B reports the platelet-neutrophil conjugate reactivity to PAF measured in diabetic and non-diabetic men and women with cardiovascular disease. NDW+CVD and DW+CVD had significantly greater platelet-neutrophil conjugate reactivity to PAF in comparison to DM+CVD (P < 0.05). (A) Summary of platelet-neutrophil conjugate reactivity to PAF for women in the study. Comparison of non-diabetic women without cardiovascular disease (NDW-CVD) versus non-diabetic women with cardiovascular disease (NDW+CVD) versus diabetic women without cardiovascular disease (DW-CVD) versus diabetic women with cardiovascular disease (DW+CVD). NDW+CVD and DW+CVD had significantly less stimulation ratio of platelet-neutrophil conjugates in comparison to DW-CVD (P < 0.05). (B) Summary of platelet-neutrophil conjugate reactivity to PAF for women and men in the study. Comparison of non-diabetic men with cardiovascular disease (NDM+CVD) versus non-diabetic women with cardiovascular disease (NDW+CVD) versus diabetic men with cardiovascular disease (DM+CVD) versus diabetic women with cardiovascular disease (DW+CVD). NDW+CVD and DW+CVD had significantly greater stimulation ratio of platelet-neutrophil conjugates in comparison to DM+CVD (P < 0.05). The percentage of platelet-neutrophil conjugates after P-selectin blockade was measured. We performed this experiment to confirm that we were examining platelet-neutrophil conjugates via the p-selectin receptor. P-selectin blockade markedly reduced the conjugate formation. 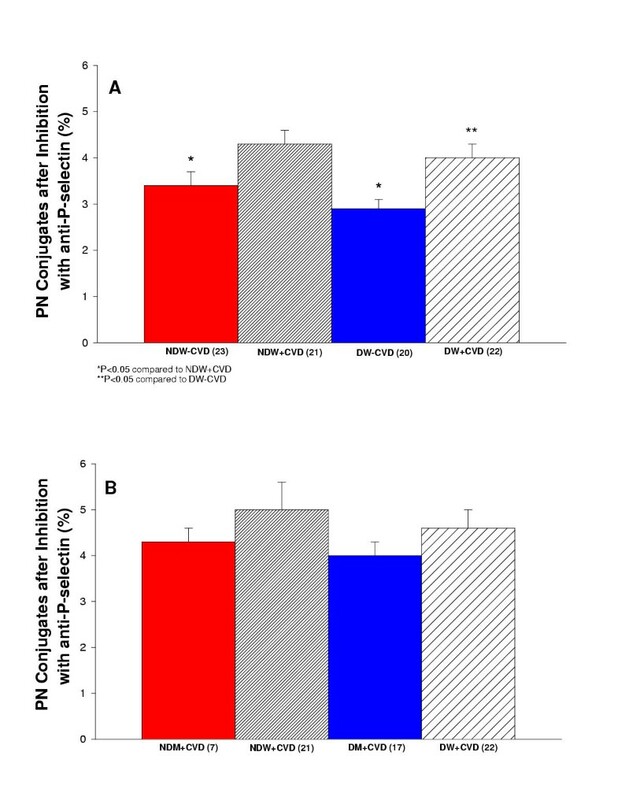 Figure 6A reports the platelet-neutrophil conjugates after P-selectin blockade measured in diabetic and non-diabetic women with and without cardiovascular disease. The blockade caused an overall 76% decrease in the conjugate. Figure 6B reports the platelet-neutrophil conjugates after P-selectin blockade measured in diabetic and non-diabetic men and women with cardiovascular disease. The blockade caused an overall 75% decrease in the conjugate. (A) Summary of inhibition of platelet-neutrophil conjugates with anti-P-selectin for women in the study. Comparison of non-diabetic women without cardiovascular disease (NDW-CVD) versus non-diabetic women with cardiovascular disease (NDW+CVD) versus diabetic women without cardiovascular disease (DW-CVD) versus diabetic women with cardiovascular disease (DW+CVD). NDW-CVD and DW-CVD had significantly less platelet-neutrophil conjugates in comparison to NDW+CVD (P < 0.05). DW+CVD had significantly greater platelet-neutrophil conjugates in comparison to DW-CVD (P < 0.05). (B) Summary of inhibition of platelet-neutrophil conjugates with anti-P-selectin for women and men in the study. Comparison of non-diabetic men with cardiovascular disease (NDM+CVD) versus non-diabetic women with cardiovascular disease (NDW+CVD) versus diabetic men with cardiovascular disease (DM+CVD) versus diabetic women with cardiovascular disease (DW+CVD). There is no significant difference among any of the groups. The estradiol levels were measured in diabetic and non-diabetic women with and without cardiovascular disease. There was no significant difference among any of the groups (Figure 7). Estradiol in non-diabetic women without cardiovascular disease was 22.1 ± 7.3. Estradiol in non-diabetic women with cardiovascular disease was 30.6 ± 8.0. Estradiol in diabetic women without cardiovascular disease was 30.2 ± 9.3. Estradiol in diabetic women with cardiovascular disease was 37.0 ± 14.0. Summary of estradiol for all women in the study. Comparison of non-diabetic women without cardiovascular disease (NDW-CVD) versus non-diabetic women with cardiovascular disease (NDW+CVD) versus diabetic women without cardiovascular disease (DW-CVD) versus diabetic women with cardiovascular disease (DW+CVD). There is no significant difference among any of the groups. Gender differences in the pathology of cardiovascular disease have not been studied extensively. There was a reduction in the overall death rate due to cardiovascular disease (CVD) in the United States during the last several decades, but the CVD reduction was less for women than men. Coronary heart disease (CHD) and stroke are the leading killers of women in the United States. Fifty percent of women will eventually die of heart disease or stroke. Several reports document that a women with CHD has a worse prognosis than men with CHD. This might indicate an increased severity of illness at presentation [8, 9]. Diabetes mellitus is an even stronger risk factor for CHD in women than in men. Diabetes is associated with three to sevenfold elevation in CHD risk among women compared with a two to threefold elevation among men . Another report indicated that the prevalence rate ratio for CHD in individuals with type 2 diabetes was 4.6 in women compared to 1.8 in men . Despite the marked difference, little is known about the pathogenesis of cardiovascular disease in diabetes to explain the discrepancy in diabetic men and diabetic women. One possible explanation is that the inflammatory response is more marked in women. Inflammation is now considered a primary cardiovascular risk factor and a recent study of predictors of cardiovascular risk ranks markers of inflammation, such as C-reactive protein, as comparable to markers of cholesterol [3, 10]. It is known that inflammation mediates the formation of atherosclerotic plaque, the major cause of cardiovascular dysfunction. We hypothesized that one possible element of the pathogenesis of cardiovascular disease in diabetes, platelet-neutrophil conjugates, a result of inflammation, is different in diabetic women and diabetic men. Rinder et al. reports 15% + 1.5% of platelet-neutrophil conjugates in patients prior to cardiopulmonary bypass  and we found 15% + 1.5% of platelet-neutrophil conjugates in healthy age matched controls. We did not find the chronic baseline concentrations of platelet-neutrophil conjugates to be significantly different among any of the groups studied. We did however observe that after stimulation with PAF (platelet activating factor), a signaling molecule released with ischemia and reperfusion , the percentage of platelet-neutrophil conjugates was significantly less in non-diabetic women with cardiovascular disease and diabetic women with cardiovascular disease compared to diabetic women without cardiovascular disease. These results indicate that there might be some blunting effect after stimulation in women with cardiovascular disease regardless of their diabetic status. When comparing men to women there were no chronic differences observed. The most intriguing results were found when comparing the response to acute stimulation of platelet-neutrophil conjugates. It was observed that non-diabetic women with cardiovascular disease and diabetic women with cardiovascular disease had a significantly increased reactivity to PAF in comparison to diabetic men with cardiovascular disease. These results suggest that women's blood may be more reactive to acute stimulus that occurs under ischemic conditions than diabetic men's blood. Platelet-neutrophil conjugates may contribute to thrombosis/inflammation and the greater severity of coronary heart disease observed in diabetic women as compared to diabetic men . The primary interaction between platelets and leukocytes is via the P-selectin receptor (CD62) on the platelets and the P-selectin glycoprotein ligand-1 (PSGL-1) on leukocytes [14–22]. P-selectin, which is stored in α-granules of platelets and in Weibel-Palade bodies of endothelial cells, is translocated to the cellular surface within 5 to 15 minutes after stimulation with histamine, thrombin, or oxygen radicals [23–27]. The binding of platelets to leukocytes was demonstrated in vitro to cause the expression of pro-inflammatory cytokines, an oxidative burst, increased expression of cell adhesion molecules like Mac-1, induce neutrophil activation, and generate signals that promote integrin activation [28–33]. Platelet-neutrophil conjugates were observed in various cardiovascular disease states . Neumann et al. determined that after an acute myocardial infarction (AMI) leukocyte-platelet adhesion was increased and remained elevated for at least five days after PTCA. It was concluded that the platelet-leukocyte conjugates might contribute to inflammatory responses in acute coronary syndromes . A study by Morse et al. reported that during cardiopulmonary bypass (CPB) patients have significantly activated platelets (increase of P-selectin) and neutrophils (increase of CD11b) . A study by Gawaz et al. reported platelet-leukocyte adhesion was increased in patients with symptomatic coronary heart disease compared to normal controls. It was also determined that when stimulated, patients with symptomatic coronary heart disease had a hyper-reactive response, which could indicate an increased risk of acute thrombotic event . The role of platelet-neutrophil conjugates in ischemia-reperfusion injury was investigated. A study by Lefer et al. examined the effects of neutrophils and platelets separately and together, but not platelet-neutrophil conjugates, in causing cardiac dysfunction in perfused rat hearts after ischemia and reperfusion (I/R). It was demonstrated that I/R hearts perfused with neutrophils or platelets alone exhibited a decreased of 10% to 12% of heart functions and when neutrophils and platelets were perfused together, the various heart functions decreased by 50% to 60%. This study also demonstrated that blocking of P-selectin decreased the synergism between the platelets and neutrophils. The possible mechanism of the decrease in cardiac function in this experiment includes neutrophil and platelet aggregates obstructing the flow of the coronary microvessels. Platelets and neutrophils can also release many toxic components, which could then decrease the coronary flow and the cardiac contractility . Another study by Kogaki et al. found that the presence of activated platelets increased neutrophil adhesion and migration after hypoxia-reoxygenation and this was inhibited with an anti-P-selectin antibody. They hypothesized that the increased neutrophil adhesion and migration via P-selectin and subsequent neutrophil activation . There is a complex interaction that occurs platelets and neutrophils. Activated platelets act as stimuli for neutrophils, but platelets may also inhibit neutrophil activation. Conversely, neutrophils affect platelets. Platelet and neutrophil cross talk may affect the development of thrombotic and inflammatory diseases . Platelets not only play a role in hemostasis but also play a role in inflammation via releasing substances with physiologic potential and by interacting with leukocytes and vascular endothelial cells involved in modulation of the inflammatory reaction . There are several components released by stimulated platelets induce neutrophil activation and chemotaxis [40–43]. Activated neutrophils produce free radicals, which in turn are potent activators of platelets [44–47]. This evidence of platelet stimulation of neutrophils and neutrophil stimulation of platelets suggests a positive feedback loop leading to further stimulation and amplification of tissue injury . A study by Aziz et al. demonstrated that short-term incubations of neutrophils with stimulated platelets causes an increase of oxidative bursts from the neutrophil . There are few reports of platelet-neutrophil conjugates in diabetic patients [49, 50], but there is evidence that diabetes is associated with chronic inflammation. A study by Vozarova et al. reported that a high white blood cell (WBC) count predicts the development of type 2 diabetes and a decrease of insulin action in Pima Indians. The WBC count was positively correlated with measures of adiposity and fasting plasma insulin concentration. The authors hypothesize that a chronic activation of the immune system may play a role in the pathogenesis of type 2 diabetes . Studies by Thorand et al. and Barzilay et al. also found that low-grade inflammation (in particular increased C-reactive protein) was predictive of an increased risk of type 2 diabetes mellitus in middle-aged and elderly men [52, 53]. Platelet aggregation in atherosclerotic coronary arteries contributes to acute myocardial ischemia. After coronary artery occlusion and reperfusion, leukocytes become activated, sequester in the microcirculation and release oxygen free radicals and proteolytic enzymes. The radicals and enzymes may be responsible for progression of vascular and cardiomyocyte injury . Superoxide radical-mediated endothelial injury causes smooth muscle contraction and decreased endothelium contraction . The vascular injury from the oxygen free radicals may then cause a decrease of coronary blood flow reserve and coronary reactivity after reperfusion [56, 57]. The physical obstruction of the microvascular bed by activated leukocytes and decreased neutrophil deformability are possible factors by which leukocytes contribute to vascular injury seen in ischemic coronary artery disease [5, 6, 54, 58, 59]. Platelet-neutrophil interaction localizes both cells but also creates an optimal environment for the exchange of mediators and metabolites . Binding of platelets to leukocytes modulates a variety of leukocyte function including cytokine synthesis [60–62] , surface expression of adhesion receptors, like CD11/CD18 [28, 63], and oxidative burst . Diabetic patients have an increased risk of cardiovascular disease; which is much more severe in diabetic women. One of the links between diabetes and cardiovascular disease is inflammation. Hayden et al. hypothesized that type 2 diabetes mellitus is a vascular disease (atherosclerosis) and that NOS, NO, and redox stress, components of inflammation, play a causative role in type 2 diabetes, in turn causing atherosclerosis . An increase in WBC, pro-inflammatory cytokines, and C-reactive protein are all linked to the development of diabetes. Inflammation contributes to the development of atherosclerosis, creating a more severe lesion. Inflammation is now considered a primary risk factor for cardiovascular disease [3, 10]. In this study we decided to examine one component of inflammation, platelet-neutrophil conjugates, in six groups of diabetic and non-diabetic patients with and without cardiovascular disease. We found an increased propensity for female blood to form conjugates in response to acute stimulation. An increase in platelet-neutrophil conjugates in diabetic patients could potentially be one of the factors causing more severe cardiovascular disease in diabetic patients, particularly women. We also examined the differences of estradiol levels in the women to determine if estrogen levels were a possible explanation for the differences in inflammation, but there was no significant difference in estradiol levels between any of the groups. This implies that estrogen is not playing a role in the differences of platelet-neutrophil conjugates that we found. In conclusion, the findings of this study indicate that: 1.) the baseline concentrations of platelet-neutrophil conjugates were not significantly different among any of the groups studied, 2.) after stimulation with PAF, the percentage of platelet-neutrophil conjugates were significantly decreased in non-diabetic women with cardiovascular disease and diabetic women with cardiovascular disease compared to diabetic women without cardiovascular disease, and 3.) non-diabetic women with cardiovascular disease and diabetic women with cardiovascular disease had significantly increased conjugate reactivity compared to diabetic men with cardiovascular disease. There was a significant increase in the age of the women with cardiovascular disease in comparison to women without cardiovascular and this could possibly effect the results. Another influence on the results could be the different drug therapies that the patients are on. In particular, statins are known to reduce inflammation via decreasing concentrations of C-reactive protein and upregulating endothelial nitric oxide synthase [65, 66]. We found that the proportions of patient on statins are not significantly different among groups, making statins less likely to influence the results. Another observation that was made was the decreased amount of diabetic women without cardiovascular disease that were on aspirin therapy. This group demonstrated an increase in platelet-neutrophil conjugates after stimulation with PAF. This could be a result of the lack of aspirin therapy in this group. One of the limitations of this study is that diabetic patients without cardiovascular disease could include patients with silent coronary disease. Another limitation is that a multivariant analysis was not performed. 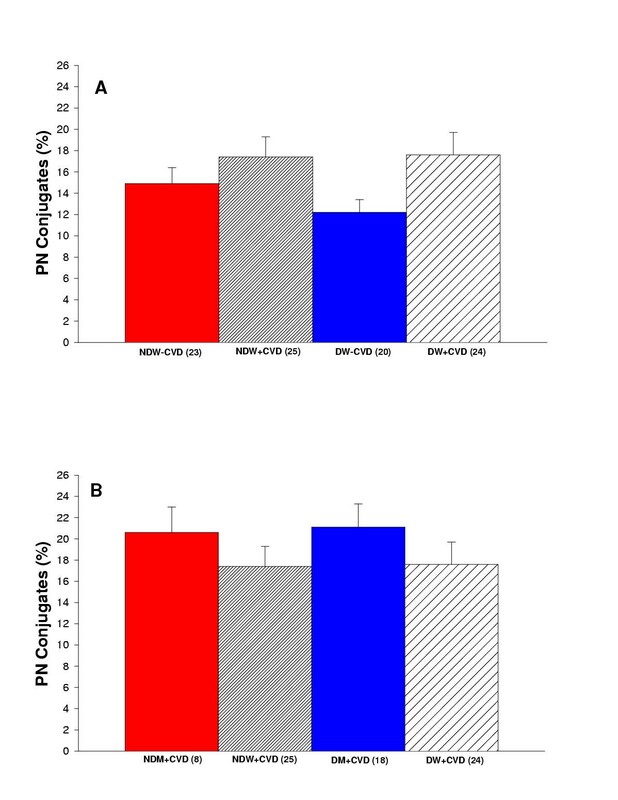 These results suggest that one of the potential causes of the difference of severity of cardiovascular disease between diabetic men and diabetic women is the diabetic women's propensity to hyper-react to an acute ischemic stimulus and activate platelet-neutrophil conjugates more than that of diabetic men. The increased number of neutrophil-neutrophil conjugates may localize both cell types in the microcirculation causing obstruction and ROS release. In addition, the complex activation of each of the cells by the other could occur creating a positive feed back loop of increased inflammatory activation. This increase in inflammation may then possibly increase the severity of thrombosis and cardiovascular disease. I would like to thank Sam Marion and the Hoyer laboratory for their help with the estradiol assay. This study was supported by NIH HLB 58859 and HLB 07429 Training Grant. HT carried out all experiments and drafted the manuscript. GD aided storage of the blood samples, ordered materials, and managed the laboratory. SG participated in study design, patient recruitment, and analysis. JC participated in study design and analysis. PM conceived of the study, and participated in its design and coordination, analysis and manuscript preparation. All authors read and approved the final manuscript.